For our last meal in Guangzhou before heading back to Hong Kong, my colleague took me to a vegetarian restaurant she used to eat at regularly when she worked in the southern Chinese city. It's called Yi Tian Yi Su (一天一素) and there are two locations; we went to the one in Zhu Jiang New Town. The other is in Taikoo Hui Mall. We arrived after 6pm and perhaps because it's Qing Ming holiday, there weren't many people in the restaurant, though two tables with window seats were reserved. Some of the staff recognized my colleague so we had some friendly banter. The menu is pretty straight-forward with interesting vegetarian items on the menu. Since there were only two of us we couldn't order much, but in the end we couldn't finish it all. We started with a soup (39 yuan) featuring many ingredients, like wai san or mountain yam, cashews, dragon eye or longan, and lotus seeds. At first it tasted bitter, but the soup, which had no added salt, interestingly seemed sweeter towards the end. 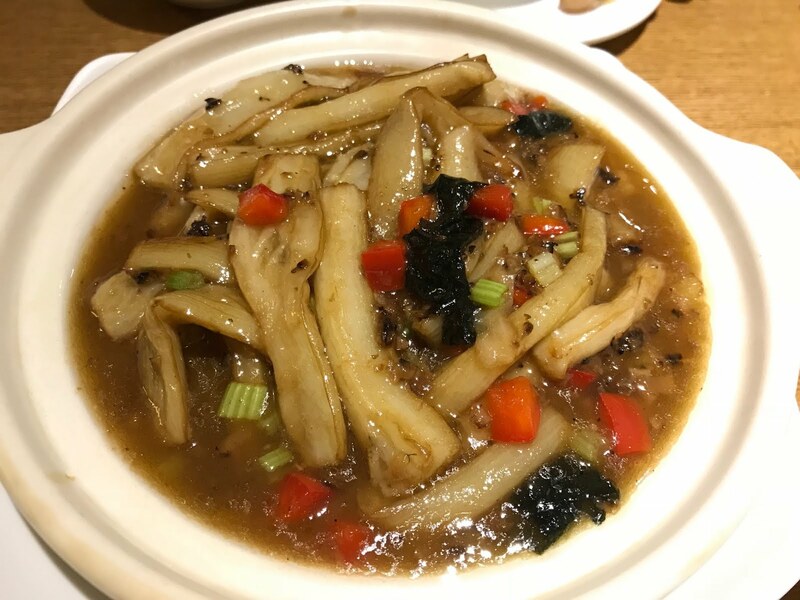 We also ordered braised eggplant with seaweed (36 yuan) and the outer skin of the eggplant was peeled and sliced relatively thinly. It was not oily at all and was delicious. 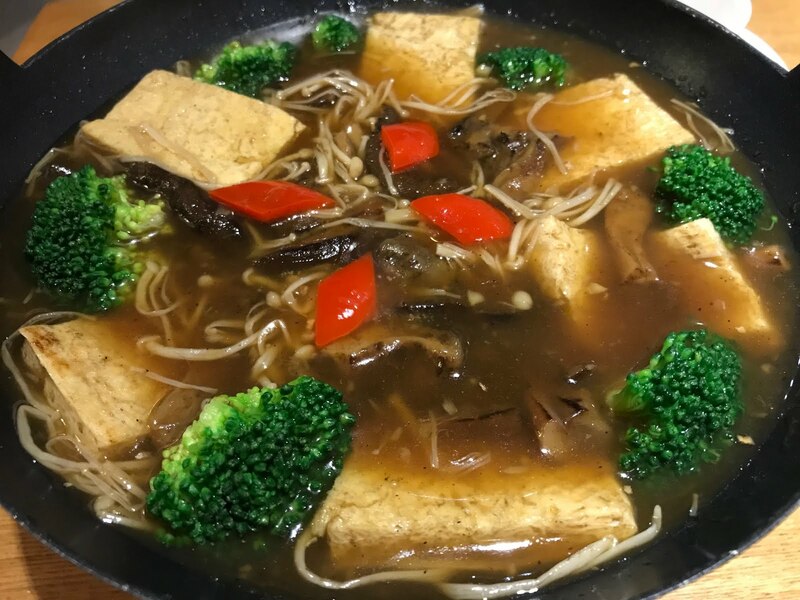 The other dish we had was tofu with various mushrooms including shiitake and Chinese mushroom, and a few broccoli florets (66 yuan). I enjoyed the mushrooms more than the tofu that seemed to taste watery. It would have been better if it was silkier in texture. Our rice was dotted with red rice for a healthier meal. It was a good way to balance out our trip as the night before we had a really oily dinner. We were fully sated for our journey home. The bill totaled 151 yuan including a charge for tea and rice.